The recently revamped Google Play Store is one of the most frequented application stores on the Internet. Competing head-on with the iTunes Store, the free marketplace lets you browse, download, and purchase variety of applications without any hassles. And though the store suffices the needs of almost every app-hungry user, it doesn't, however, provide access to apps that violate Google policies. Furthermore, modders and rooters are always ready to try out variety of new apps, many of which aren't available in the Play Store. While it might seem a bit weird for a big company like Amazon to invest in an alternative to the Google Play Store, it does, in fact, help the retail giant cater to the needs of its huge user base of Kindle Fire consumers. The Amazon store isn't that different from the Google Play Store; it doesn't offer any banned apps, nor does it provide any special apps of its own. The only advantage that the Amazon app store has over Play Store, and also other competing app stores, is the fact that it gives away one app for free everyday. This makes the store a perfect choice for all the users who are always on the hunt for freebies. GetJar is perhaps the biggest app store on the Internet. Founded in Lithuania in 2004, the store provides more than 350,000 applications for Android, Blackberry, Symbian and other devices. GetJar, thanks to its versatility, is quite popular amongst developers as well as users. The site sees about 3 million downloads a day, which is quite an achievement for an independent app store. 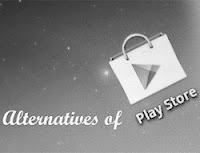 The store can easily be seen as a replacement for the default Play Store. AppBrain is one of the most frequented alternative stores for Android. Rather than being yet another app store, AppBrain serves more or less like a website for discovering and sharing new Android apps. Once you download an app, it gets added to your custom wish list that is then stored on your AppBrain account. Since AppBrain doesn't distribute apps, purchase of paid apps happens via the Play Store itself. The most important feature of AppBrain is its discovery engine, which lets users stumble upon new apps. Also, each app’s page has a detailed description of the title, something that you won’t find on all apps in the Play Store. Installing of apps can be done via two methods: you can either use the link leading to the Play store and install it from there, or you can use AppBrain’s fast installer. The Fast Web Installer is an application that lets you push applications to your smartphone just like you do in the Play Store. To get started, all you have to do is install the Fast Web Installer application on your phone. Overall, AppBrain is one of the rare marketplaces that can be used as a viable replacement for the original Play Store. A must try even if you’re not willing to quit the Play Store. SlideME is an app store that is more lucrative for developers than end users. While Android Market keeps 30% of your app price and gives you the remaining 70%, SlideMe offers much better payouts so that developers can benefit the most. As for the applications, users can browse through thousands of titles, or they could just search for an app they like. To install a particular application, simply click on the Download button and save the .apk file to your computer. You can then transfer this file to your Droid and install it from there. Also, you can send this .apk file to your friends so that they could also install the app on their phones. Overall, the variety of apps offered in this store is nothing compared to what we have on AppBrain; however, it’s still a great place to publish new apps and download apps from. I think AppsApk.com is one of the best play store alternative site.